The flu season is officially here. With the bi-polar weather being incessantly present, we have to be vigilant in keeping ourselves healthy at all times. I love that United Home Products have been my reliable partner in making sure I am in my tip top shape. Because the old adage, “Beauty is only skin deep,” might as well apply to being healthy. Because the truth of the matter is, what’s inside is bound to manifest on the outside – from the inside out. 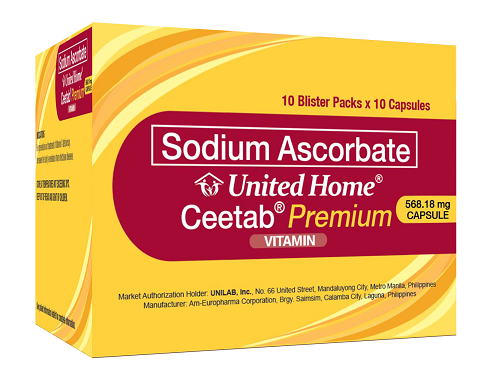 United Home Ceetab Premium is my non-acidic choice of Vitamin C everyday. Its formulation is Sodium Ascorbate. A box has 10 blister packs with 10 capsules. I use this in prevention and treatment of Vitamin C deficiency. I have not had colds this year. A capsule is only P4.50 each. Iron-deficiency anemia is oh so prevalent, especially with those who work online like I do. I am grateful enough to be in a non-graveyard shift, but for those who are, anemia is something that we should work hard to fight against. This also applies to bloggers the world over. We tend to do our blogging tasks in the wee hours of the night. Thus, making us an easy magnet to have anemia. 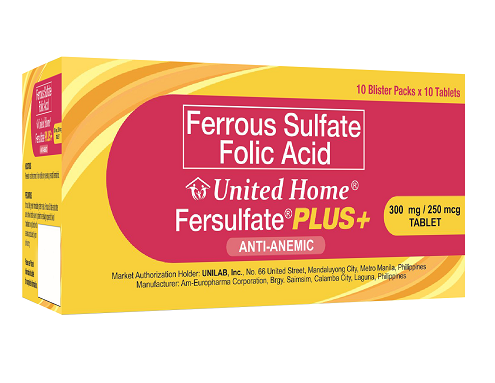 United Home Fesulfate Plus comes in a tablet format, with formulation of iron plus folic acid. If you are looking to prevent and treat iron deficiency anemia, or prenatal hematinic, this one is it. Retails for P3.50/pc. 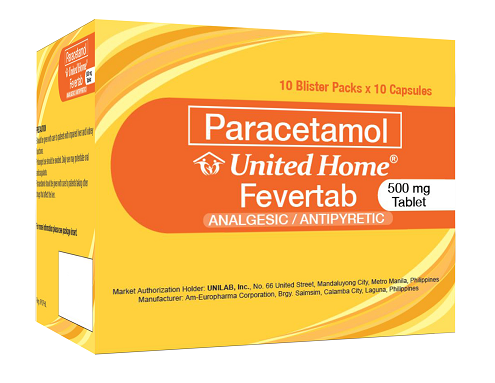 And in case the bug got through you, United Home Fevertab 500mg to the rescue. For only P1.50 a piece. It is used for fever management, and relief of minor aches and pains. And because it is not a perfect world, we catch some virus every now and then. 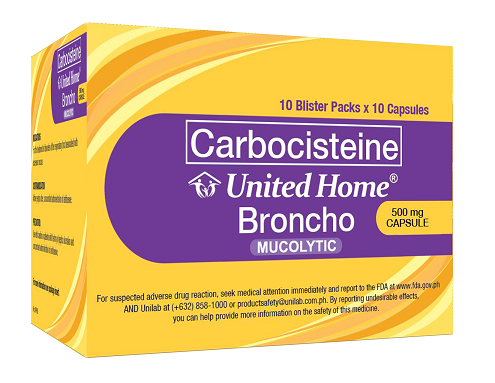 United Home also carries Carbocisteine in the form of Broncho in 500mg capsules. It is used to relieve cough characterized by excessive or sticky sputum or phlegm. It also helps treat respiratory tract disorders such as acute and chronic bronchitis and chronic obstructive pulmonary disease (COPD). Retails for P4.50 each. When it comes to our health, let us not take our chances. United Home Products, supplement and medicines are ever reliable, and always deliver.